Gunnerside is a very small attractive village in Swaledale situated between the River Swale and its tributary Gunnerside Beck. Gunnerside has a small pub The Kings Head, a working smithy come museum, a Methodist Chapel, primary school and a post office which is only open at certain times. The old working smithy was established in 1795 and all the objects on display, which have accumulated over the years, are from the smithy itself. Horses were used on farms until the 1950’s so horse shoes was a prime job for the blacksmith. The Calvert family have run this smithy for six generations and is open from Easter to the end of October. Gunnerside Gill is the smaller valley running northwards, opposite the pub, at right angles to the Swale Valley. The more you walk up this gill the more beautiful and interesting it gets, from a mixture of woodland and sheep pastures to the scares left from the mining. The colours of the landscape are really amazing especially on a sunny day but in the winter months it becomes rather bleak. 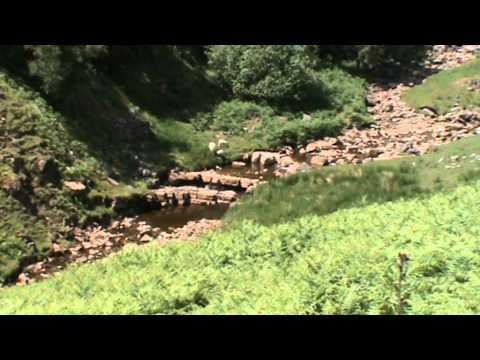 Gunnerside Gill is the site of intensive lead mining in the 18th and 19th centuries and you can see the evidence of the past in the upper parts of the Gill. Streams were dammed and the water released as a torrent to scour soil off the surface to reveal lead ore seams. The scars that are left are known as hushes and the many spoil heaps and ruined buildings are the signs of the heavy mining activity. 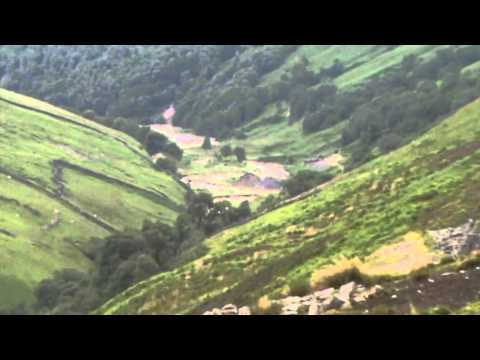 In the upper reaches are the remains of Blakethwaite Smelt Mill and in the lower reaches is The Sir Francis mine which was the first mine to use compressed air drills, but failed to make good returns. The large building is the remains of the mine offices. The waterfalls in Botcher Gill, a tributary of Gunnerside Beck, contain numerous fossils. We park in the car parking area in Gunnerside then walk over the bridge and take the path on the right of Gunnerside Gill. We walk a short way to a building here we turn right and follow the path round the back of the building. We follow the path keeping close to Gunnerside Beck, going through the trees, over stiles and then we come to open fields. As we come to the remains of a mine we take a good look around. We then go back to the path and carry on forward until we come to some more remains of a much bigger mine where we take time to explore. We then carry on following the path up the valley, still with the beck on our left, until we then come to a cross roads of paths and we take the downward one towards Blakethwaite Dams. We come to a fork in the path and we take the left path still going down until we come to two ruined buildings, which one was once the peat store, at the bottom of Blind Gill and take another look round. We keep to the path heading forward until we reach Blakethwaite Dams. We now take a break to have some lunch. We then follow the same path back to the peat store at the bottom of Blind Gill where we then cross over the Gill and turn left onto the track on the other side with Gunnerside Beck on our left. We now follow the track uphill, going through a gate at Botcher Gill, where there is a waterfall on our left. We carry on following the track until we come to a right angled bend and take the path off to the left to take us back down into Gunnerside. The views on this walk are absolutely awesome so do not forget to take your camera. Gunnerside is in Swaledale in the Yorkshire Dales. From the A1 take the A684 for Bedale and then Layburn. At Leyburn roundabout turn right and take the left turn for Bellerby and then Reeth. At Reeth take the B6270 for Gunnerside. There are public toilets down the alley way next to the pub. For Refreshments there is the Kings Head pub and ice creams etc at the museum. If you wish to stay for a day or two there are a few B&B’s. Very good John. I am really impressed. Thanks Jack for the comment. At the moment, as the weather is getting better, we are out and about filming new and hopefully different walks. Keep watching we will have a new walk out soon. Thanks john. Hello John, very much enjoyed the video, great views good commentary and informative,Thank you. one to walk after rain when the waterfalls are in full flow. Just had a look at the video John,and it looks good to me.If the weather is’nt too bad next week i’ll give it a go and let you know.Cheers.